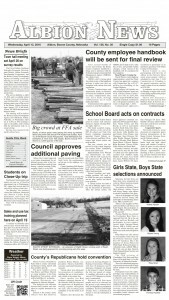 The Boone Central Bowling Club, which began last year under the direction of Fairview Lanes Operator Mitch Patzel, is ready to roll into 2011-12 with cooperation from the weather. Boone Central was set to open the season this past Saturday, but had matches at Leigh postponed due to the wintry road conditions. The Cardinal boys team hoped to get started Tuesday night with competition at Newman Grove and is scheduled to host Newman Grove in return matches Tuesday, Dec. 13, at Fairview Lanes (6:30 p.m.). Patzel said the bowling club will also be holding a team scrimmage Sunday, Dec. 18, that is open to the public. The event is a fundraiser to help offset club expenses, since high school bowling is not supported by schools and the NSAA. Hotdogs, chips and sodas will be served, beginning at 12 noon, with a free will donation. 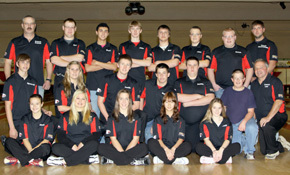 Boone Central students in the bowling club this year are Mariah Patzel, Kelsey Lee, Toni Rasmussen, Jessica Tisthammer, Saki Masuno, Shelby Schafer, Kyra Verrips, Alex Mousel, Spencer Noble, Justin Rasmussen, Nathan Hemmer, Robbie Johnson, Justin Wieser, Aaron Hamling, Brody Kelley, John Kennedy, Drew Wirges, Lane Cornwell and Kaleb Kelley. Duane Lee and Jared Rasmussen serve as coaches with Patzel. Complete Details in Print & Online Editions of Albion News.